These airbrush colours provide a great coverage over a wide range of mediums including sugar paste, fondant, modelling paste, chocolate, flower paste and marzipan. 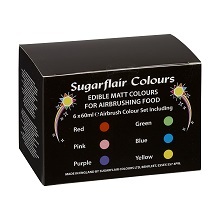 These Sugarflair airbrush colours can be used in any brand of airbrush machine. These colours dry very quickly allowing you to spray a second or third coat to build the desired shade.